As I continue to work on getting my new used RT ready for the road this summer I was wondering if anyone wants to chime in on their favorite tank bags? Is the official larger BMW bag worth the ungodly price? What other options are there for third party tank bags that work well with the tank rails on the RT? I've got other tank bags I like, but of course they are all magnet based. FYI I would prefer one with some kind of clear sleeve on the top of it for a map or whatever. I assume most have that anyway. 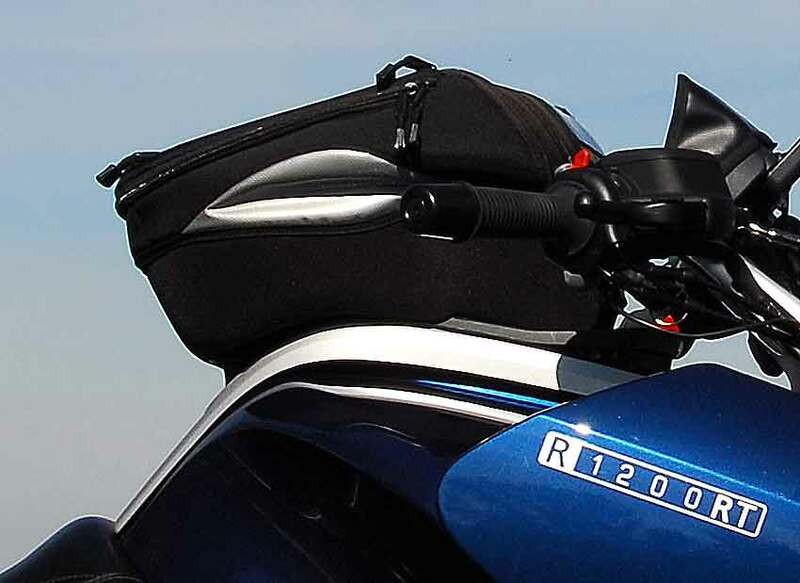 One of the benefits of the pre-2014 oilhead R1200RTs was its great tank-bag mounting system. If I still had one those models that is what I would use. It does have a map window. Digtlartst, Iscadean and North Woods Wanderer like this. Last edited by jeffdean; Apr 15th, 2019 at 6:59 pm. I have a 2009 RT and have the tank bag from BMW as well. While the map window is nice, you’ll find many used examples out there that have had too much UV exposure and the window yellow as it ages. On the subject of the map window, don’t even think about putting your iPhone in there as it acts like a hothouse and your iPhone will overheat. That being said I also find it difficult to look that far down to refer to a map unless I’m just doing it at a stop. The bag itself is fairly roomy and totally functional but there’s no way to lock it to the bike without some modification...so usually at a lunch stop I pop my GPS off, throw it in the bag and just grab the handle take it off the bike and pack it inside with me. You might try to find a good used one because they are available occasionally at a decent price and are made to exactly click into the holes of the trim on top of the gas tank. I think someone made a foam divider or plastic divider you can fit inside to give you different compartments in the main section, but that was way too expensive and really not needed. Thanks so much for the advice and description of how you use the bag. Very helpful. Yes, I have seen some of the yellowed used ones out there. Even used these tend to be priced on the high side, so I have been trying to find some decent alternatives. I'm curious if any third parties have made one with a mounting system to work with the RT's tank rails. Thanks for the pix Jeff! Has anyone tried any of the third party tank bags on their RT? I've seen some that use the gas tank ring as an anchor point, and at least one manufacturer (SW Motech) does make an adapter for the RT that allows that to work with the RT tank rails. But I'm not sure if anything else secures those types of bags besides the tank ring. There are also alternatives using straps. Not all that excited to put more straps on my tank, but if there was a really good bag and it was considerably cheaper than the BMW bag I'd consider it. Cortech has at least one that might be an option that is under $100 new. Somiti also has one, although I know nothing about that company or its quality. Thanks for the post tvguy. I agree it is simplest. But I'm still interested in hearing from some others for two reasons. First, cost and second, that there might be some compelling features or functionality differences in a third party bag. I mean, let's face it, BMW extras are not always the best value, and or not always the best option either. At least I've come to that conclusion looking at top cases. It's much smaller than the BWM bag, so I had to consolidate the crap I carried, which wasn't a bad thing. I'm pretty sure the bag stayed attached when I totaled the RT last summer, so the connection system (you have to buy the correct ring attachment: https://www.twistedthrottle.com/bags...-r1200st-05-10) seems to be pretty solid. I liked the bag well enough. But, I think I liked the BMW bag better. Apples and oranges, I guess. "Looks like I picked the wrong week to stop sniffing glue..."
I bought the BMW RT bag and it was nice but to big. Then a friend gave me an old BMW RT bag. I took the BMW bag off and mounted the Chicane to the rack. It was sweet. You may want to look at RKA Luggage in Nor Cal. Talk to Richard. I am using an RKA bag and luggage on my '16RT... Its very nice gear. See if you can find an old RT rack bag on ebay or somewhere then toss the bag and mount what you want to it. New member joining in with similar concerns about a tank bag. I like tank bags when I go on day trips or touring, but I don't need one for my daily Southern California freeway commuting. I have an older magnetic mount bag that I have used on my Triumph Tiger Explorer that works pretty well, but of course is useless on my new 2013 R100RT. I also recently acquired an SW-Motech Engage tank bag (it came as a package deal with an X-creen windshield deflector for a good price,) and although I didn't really need it, it is a nice smaller alternative to the magnetic one. The Motech uses an EVO tank ring mount that makes it easy to just snap-on or off, and I can store it in my Givi top case (see top-case thread reply.) The ring mount came with the bag for my Triumph. I wanted to also use this tank bag on my RT, however, Twisted Throttle does not list a tank ring adapter for a 2013 and earlier R1200RT. The BMW specific tank bag rails get in the way. Last edited by rockitcity; Apr 18th, 2019 at 1:14 pm. New member joining in with similar concerns abut a tank bag. I like tank bags when I go on day trips or touring, but I don't need one for my daily Southern California freeway commuting. I have an older magnetic mount bag that I have used on my Triumph Tiger Explorer that works pretty well, but of course is useless on my new 2013 R100RT. I also recently acquired an SW-Motech Engage tank bag (it came as a package deal with an X-creen windshield deflector for a good price,) and although I didn't really need it, it is a nice smaller alternative to the magnetic one. The Motech uses an EVO tank ring mount that makes it easy to just snap-on or off, and I can store it in my Givi top case (see top-case thread reply.) The ring mount came with the bag for my Triumph. I wanted to also use this tank bag on my RT, however, Twisted Throttle does not list a tank ring adapter for a 2013 and earlier R1200RT. The BMW specific tank bag rails get in the way. Ok, let’s see if I can do this from my phone... working at night! I also had to fabricate a stand-off from some 1/8" plywood to increase the space between the tank bag mount and the bag itself to allow the release catch to work. " I see the nylon bushings but not totally clear where you used the plywood shim. Does the bag mount ring separate from the bag? Yes, on the bottom of the bag (actually recessed into the bottom of the bag, taking up about an inch of interior room) is the mounting piece that connects to the ring. The bag mount piece is actually screwed onto the bag from within, and is made so you can adjust the position of the bag on the mount. The bag was interfering with the mount mating to the ring so I used the plywood shim to move the mount further away from the bag. I could have used longer spacers on the tank ring, but I didn't really want to have those sharp forks on the ring sticking up any further than they already do. Sorry no pictures but it was fairly easy to do. For 2014 and later RT's the BMW rails are no longer on the tank so the ring would mount directly to the tank filler cap without the need for the spacers. The shim is between the bag and the bag mount, and is totally invisible in use. Kind of making a square peg fit into a round hole, but it allows me to use the tank bag I already had for only the cost of the EVO ring (about $20.) You can't find even worn out BMW tank bags to use for the rail mount system for anything close to that, plus I can still use the same bag on the Triumph. Thanks for all the posts rockitcity. We clearly have similar interests at present I hate to mention this now that you've done all this work, but I'm pretty sure that SW Motech has an adapter for RT rails. At least they do for certain models of their bags. SW-MOTECH Type 129 ION Tank Bag QUICK-LOCK Bottom Tank Ring. You can find them at Twisted Throttle. This should fit your 2013 RT. On the other hand, you did save yourself $50. But if you aren't happy with your creation at least you know a mount is out there. I had the same questions you did about 6 months ago. My conclusion was to find an old used BMW tank bag and use the mounting hardware and attach what ever bag you like to it. I missed out on two different BMW bags that were priced at $100 an in excellent conditions. I had to wait few months and was continually looking at different forums where equipment was sold and also ebay. I found one for $50 including shipping since the zipper was broken and the top was yellowed. When I got it I spent 15 minutes and got the zippers working. Since I only use this bag for trips, I have kept the original bag since it is large and on trips the space is nice. If I was to use it every time I rode, I will mount a smaller bag on the the mounting system. Thanks for the post. It's a great thought just to find a crappy old BMW bag for cheap and steal the base from it for another bag. I'm just not seeing any cheap ones out there at the moment. I suppose BMW could consider selling their base platform separately and allow others to use it for various solutions, but it would probably cannibalize their tank bag sales. You would think that with all the RTs out there that a third party would design a base to work with the rails and create a variety of options to put on the base. We have a zillion options for magnetic tank bags, and we've got 2 or 3 options for the RT rails. Good discussion about this issue, and yes it is unfortunate that there aren't any 3rd party options to use the BMW tank rails. 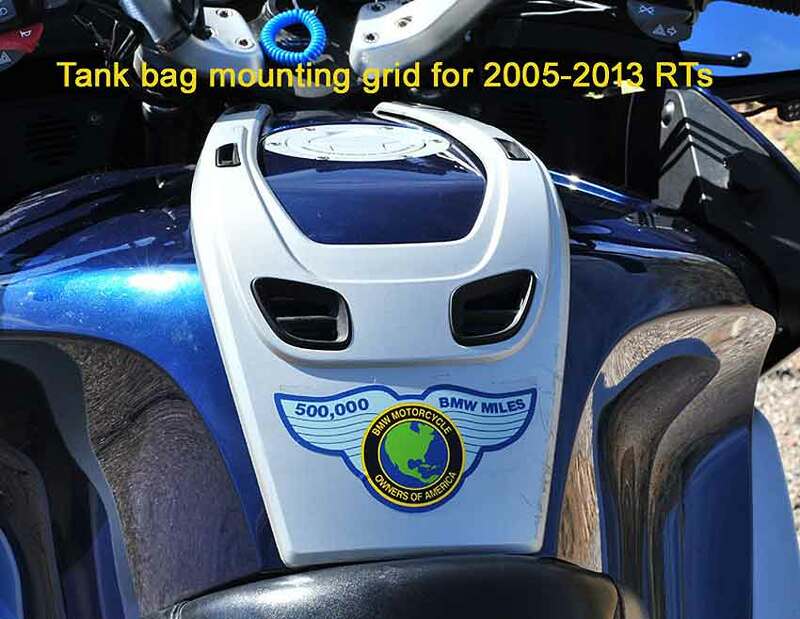 I did look at the Twisted Throttle bags (there are only two that I saw) for the 2013 and earlier RT's, but they use the ION tank ring which is different from the EVO. Since I already have a bag with the EVO mount, and also have another bike with the EVO tank ring that the tank bag was initially purchased for, I wanted to stay with that mounting system. Twisted Throttle actually did reach out to me and offered to look into getting an ION mount for the existing bag I have, but were not certain if it would be available. As it is, I'm done with this project, and for the limited usage I will have for a tank bag on this bike, I'm happy with the result. Rode it a little yesterday after getting my flat back tire plugged (will squeeze another couple of thousand miles out of the PR4's before I change the set,) with the bag on and it will work fine. BTW, I found it remarkably easy to unmount the back tire, even requiring taking the muffler off. I figure it's good to know how to do it if I need it on the road somewhere. EVO vs. ION. Now I see the problem. Too bad they can't make compatible mounting systems for all their bags. I know the ION series makes a little 9L bag and a somewhat larger (but not huge bag). Haven't looked at the EVO bags. Glad it worked out for you. I have a second-hand BMW bag which had been used occasionally to commute into London by the previous owner. Very good condition and no yellowing of the top plastic panel - in fact like new. Cost about £50 as opposed to £180 new. There is an issue of easy removability by potential thieves when left on the bike so the previous owner had drilled one of the legs for use with a hardened steel cable lock and I have a small travel lock to tie the two zips together which deters thieves - hopefully. In this way I don’t have to cart it with me whenever I leave the bike. Yesterday, decided to go up through central Wales from Somerset. Set off early and had the dreaded red flashing triangle after 100 miles. Checked the tyre pressures and sure enough the rear was dropping like a stone. I managed to get to a Shell garage in Abergavenny where the chunk of metal showed itself to be about 1/2" wide and don’t know how deep. Not possible to use the plugs and CO2 cartridges. So eventually trailered home seven hours later through insane holiday traffic on the M5. Some things are not possible even when you think you have everything covered. Upshot of the story after the bike's MOT on Wednesday with a tyre advisory showing a few hundred miles of wear left (I thought it might last the summer at least) new set of Michelin RP4 GTs coming next week. Quick check on longevity of the tyres suggests almost 8000 miles. The older you get, the more you know and the less you need.